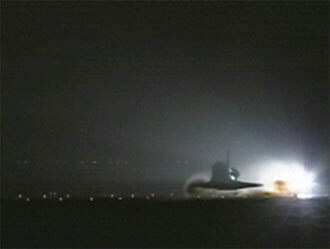 Space Shuttle Discovery touched down this morning at Edwards Air Force Base in California to successfully conclude NASA's Return to Flight Mission. STS-114 was the first Shuttle mission to fly since the loss of Space Shuttle Columbia and the STS-107 crew on Feb. 1, 2003. Discovery spent two weeks in space, where the crew demonstrated new methods to inspect and repair the Shuttle in orbit. The crew also delivered supplies, outfitted and performed maintenance on the International Space Station. A number of these tasks were conducted during three spacewalks. In an unprecedented event, spacewalkers were called upon to remove protruding gap fillers from the heat shield on Discovery's underbelly. In other spacewalk activities, astronauts installed an external platform onto the Station’s Quest Airlock and replaced one of the orbital outpost’s Control Moment Gyroscopes. Inside the Station, the STS-114 crew conducted joint operations with the Expedition 11 crew. They unloaded fresh supplies from the Shuttle and the Raffaello Multi-Purpose Logistics Module. Before Discovery undocked, the crews filled Raffeallo with unneeded items and returned to Shuttle payload bay. It was very anxious for me to watch it. It is great that they are all alright! Great reporting!